On the Cover: The 198 species of dynastine scarab beetles that occur in Mexico, Guatemala, and Belize are comprehensively reviewed. Keys in English and Spanish, descriptions, geographic and temporal distributions, notes on natural history, 885 numbered illustrations, numerous other illustrations, and maps are provided for all species. 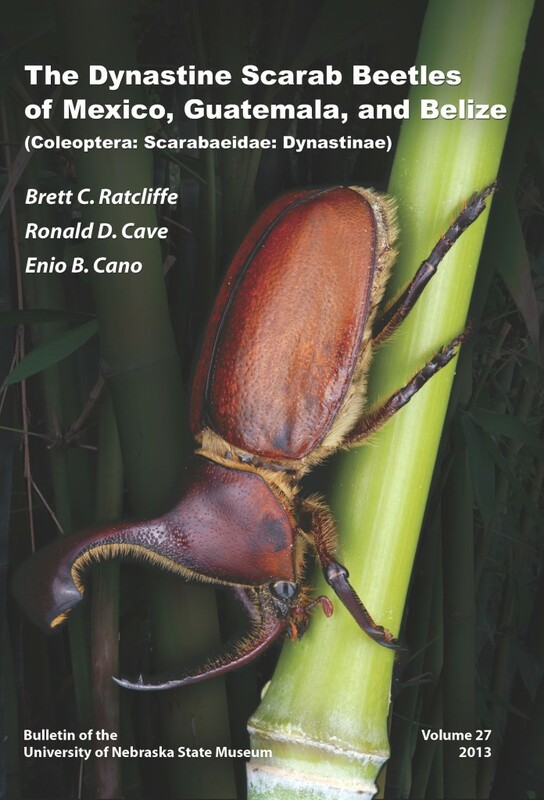 Also included are synopses of the habitats in each of the three countries and higher-level taxa, a tabular review of all the Dynastinae occurring in Mesoamerica, a glossary, a species checklist, and extensive references. The book is hard bound and all in color. Brett C. Ratcliffe, Ronald D. Cave and Enio B. Cano. 2013.The Dynastine Scarab Beetles of Mexico, Guatemala, and Belize (Coleoptera: Scarabaeidae: Dynastinae). Bulletin of the University of Nebraska State Museum (27). The Bulletin of the University of Nebraska State Museum is a peer-reviewed monograph series. The article is not available online. Brett C. Ratcliffe is professor of entomology and curator of the University of Nebraska State Museum.